Powers/Abilities: Centurius is an extraordinary genius, with exceptionally advanced knowledge of genetic engineering and other areas of science and technology. His physical form--transformed into a superior being--has athletic physical abilities, and he is reasonably experienced in hand-to-hand combat (see comments). He ages at an extremely slow rate. He wears body armor of unknown composition and undefined capacity. He has used "stun-discs" and ray guns that fired unknown energies. He also has possessed and utilized numerous means of transportation, including advanced aircraft and spacecraft, monorail, teleportation, and a thermalic supression beam (for transporting objects from Earth to his orbiting ARC). He has used hologram projectors, T-Viewers (for observing events occurring elsewhere on Valhalla), an orbiting space ARC equipped to sustain numerous life forms for a century, etc. Valhalla contained a massive fortress loaded with advanced technology and myriad life forms. (X-Factor I Annual#3/3) <October, 1928> - Noah Black attended the International Conference on Genetics in Geneva, Switzerland, where he engaged in discussion with a group including Wladyslav Shinksy and Arnim Zola. (Nick Fury, Agent of S.H.I.E.L.D. I#2 (fb) - BTS) - Dr. Noah Black was a Nobel Prize winner in the 1930's. (Nick Fury, Agent of S.H.I.E.L.D. I#2 (fb) - BTS) - "Years ago" Black discovered (or just became convinced) that life as we know it evolved from internuclear space. When he revealed this to his colleagues, he was ridiculed for theorizing that every atom was a sub-miniature solar system in itself (see comments). (Nick Fury, Agent of S.H.I.E.L.D. I#2 (fb) - BTS) - Unable to continue his experiments, Black came to the island Valhalla and developed an evolution process. What had taken centuries now took only seconds...worlds evolved from a single drop of water. The Evolutionizer produced hundreds of life forms from the microcosm, many that are completely alien by Earth standards. Others were not unlike those of prehistoric Earth, the direct antecedents of man. (Nick Fury, Agent of S.H.I.E.L.D. I#2 (fb) - BTS) - Black's own Evolutionizer kept him young despite the passage of time. (Nick Fury, Agent of S.H.I.E.L.D. I#2 (fb) - BTS) - Black created his Arms-Men, humanoid mutates subservient to him. (Nick Fury, Agent of S.H.I.E.L.D. I#2 (fb) - BTS) - Black hid his base within a hologram (or "astral projection") of an active volcano. (Nick Fury, Agent of S.H.I.E.L.D. I#2 (fb) - BTS) - Black forbade weaponry on Valhalla, except in the hands of his Arms-Men, who used them for protection against dangerous mutates. (Nick Fury, Agent of S.H.I.E.L.D. I#2 (fb) - BTS) - Black paired off his new life forms and began beaming them into space aboard his Automated Rebirth Colonizer (ARC). He designed the ARC such that when it was full, it would begin to orbit the Earth and assail the Earth with an all-consuming rain of radioactive fire for forty days. Centurius saw mankind as already hell-bent on its own destruction. Via this assault, Centurius intended to hasten this event. Exactly one century later, the ARC would land on the uninhabited Earth, which he foresaw as resembling the Garden of Eden. He saw this as a chance to create a new world bereft of mass murder, intimidation, bigotry, hatred, fear, war, and violence. Presumably based on this plot (or his own age), Black took the name Centurius. (Nick Fury, Agent of S.H.I.E.L.D. I#2 (fb) - BTS) - PDQ Warner's film crew, including actors Brad Carter and Tiffany, set off a film site on Valhalla. (Nick Fury, Agent of S.H.I.E.L.D. I#2) - The transport beam from Valhalla Island struck a S.H.I.E.L.D. ship carrying Jimmy Woo and Nick Fury. Woo escaped via an eject seat/personal jet-craft, while Fury's ship was shattered and he was captured by a giant butterfly mutate that brought him before Centurius. (Nick Fury, Agent of S.H.I.E.L.D. I#2 (fb) - BTS) - As soon as Woo's craft hit the water, a force pulled him to the island, and then an elevator transported him to Centurius' fortress. (Nick Fury, Agent of S.H.I.E.L.D. I#2) - A thermalic suppression beam transported Fury to Centurius' fortress and he was brought before Centurius, restrained by the Arms-Men. As Fury introduced himself, Woo joined them, and then Centurius revealed his past and his goal was to save life on Earth. 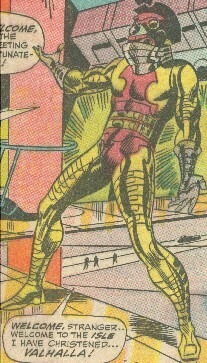 Fury initially offered Centurius the chance to return to society, which might now welcome his theories. Centurius then revealed his genocide plot and insisted that Fury and Woo remain on Valhalla, but while Centurius was distracted, Woo tackled the Arms-Men, and Fury escaped. Boarding a passing railcar, Fury's craft was torn from the air by a tyrannosaur-like creature, and Fury fell into quicksand, but was saved by Brad Carter. Fury convinced PDQ Warner to use their robot giant ape, Kong, to battle the dinosaur, allowing Fury and the others to make it past the reptile and back to Centurius' base. Fury impersonated one of the Arms-Men and was quickly discovered, but Woo then tackled Centurius. Woo was quickly flattened by Centurius, but the mad genius realized that Fury threatened his entire plot. Hoping that his own Evolutionizer could transform him into a superior being to defeat Fury, Centurius leapt into it, but the device's energies instead caused him to "complete the evolutionary cycle, turning back into a handful of protoplasmic slime!" With Centurius' defeat, his ARC fell out of orbit and crashed on Valhalla, which Fury, Woo, Warner, Carter, Tiffany, and the rest of the film crew barely escaped. (Rampaging Hulk I#3/2 (fb) - BTS) - Centurius eventually "re-evolved into an infinitely superior being" as he had intended. Under uncertain circumstances he became allied with the Conspiracy, a name given to a group of five beings necessary to open a dimensional portal to allow the Exo-Mind to access other dimensions. Centurius plotted with Atlan, Dr. Juden Bardham, Kaballah, and Bubbles O'Day to depose and replace the group's oldest member, Uluxy'l Kwan Tae Syn. (Rampaging Hulk I#3/2 (fb) - BTS) - Centurius established another base in the mid-Atlantic, using holograms to disguise his citadel as a peaceful, uninhabited island. (Rampaging Hulk I#3/2 (fb) - BTS) - Centurius began to abduct a number of the world's greatest minds, placing them in those classic-comic-book stasis tubes where he drained their mental energies. He also began to collect Bloodgem fragments, intending to combine their power with the mental energies from his genius captives to takeover the world. (Rampaging Hulk I#1/2 - BTS) - Three agents of Centurius assaulted the Port Authority of Rio de Janiero, claiming a Bloodgem fragment discovered by the customs agents there. They slew the agents to make sure the gem made it aboard the intended ocean liner, which they boarded incognito. Later, the agents of Centurius ambushed Brad Carter--who had since allied himself with Ulysses Bloodstone--in his sleep, knocking him out. They attempted to ambush Bloodstone as well, but he had heard their assault on Carter and was prepared for them. Bloodstone easily took out the men, knocking one overboard and turning the other two over to the ship's security (and notifying them of the man overboard). Sometime later, Centurius sent Goram to attack the ship, tearing open its cargo hold and knocking the suitcase containing the Bloodgem fragment into the water. Bloodstone attacked Goram, sensing the piece of the Bloodgem, but was overpowered, and Goram escaped with the suitcase. (Rampaging Hulk I#2/2) - Goram crossed the ocean floor to Centurius' base, where an energy beam stabbed out and immobilized him, allowing a pair of Arms-Men to pilot a craft to claim the suitcase and bring it into the base. Goram was then sent to assault Bloodstone Island. Goram was driven off, and while Bloodstone fought another Conspiracy agent--the Killer Shrike--Brad Carter piloted a sea craft and followed Goram back to Centurius' base. There an energy beam pulled him inside, where he was confronted by Centurius and his Arms-Men. Meanwhile an unnamed bat-creature (another agent of Centurius) assaulted an airplane carrying Dr. Oliver Quinn, who apparently held another Bloodgem fragment. (Rampaging Hulk I#3/2) - Brad Carter was restrained before Centurius, who revealed how he'd survived, what his current plot was, and that he intended to slay Carter once he had been successfully used as bait to lure Ulysses Bloodstone. Just then, Ulluxy'l teleported into Centurius' base, warning him of the power he challenged. However, when Ulluxy'l warned Centurius that he was backed by the Conspiracy, Centurius burst into laughter, revealing that he himself was actually part of the Conspiracy. Meanwhile, Iron Man--who had joined forces with Ulysses Bloodstone to track down the abductor of the missing scientists--located and assaulted Centurius' base. Iron Man made short work of the Arms-Men, but one of them unleashed the bat-creature against him. At the same time, Bloodstone invaded the base, fighting his way past more Arms-Men, destroying some of Centurius' robot warriors, and even incapacitating Goram. However, as Bloodstone confronted Ulluxy'l, Centurius fired an energy weapon powered by one of the Bloodgem fragments, which struck Ulluxy'l, apparently slaying him. Nonetheless, Iron Man defeated the bat-creature, causing it to come crashing into Centurius' base, and Centurius--having slain Ulluxy'l and usurped his place in the Conspiracy--decided that he no longer needed this base. He teleported away and activated the warheads ringing his base. (Rampaging Hulk I#4/2 - BTS) - Bloodstone, Iron Man, and the recently arrived S.H.I.E.L.D. agents escaped the base before its destruction. The Conspiracy sent their agent Domino to occupy Samantha Eden to prevent her from distracting Bloodstone from his single-minded mission of vengeance. (Rampaging Hulk I#5/2 - BTS) - The Conspiracy manipulated Bloodstone into "Suite Fear," a hotel room containing a series of death-traps, though he escaped. Meanwhile a Conspiracy agent (robot) cleared and then blew up a subway car headed uptown from Greenwich Village. In addition, the Conspiracy sent the disassembled Modular Man to Delenor (Delano?) Hospital, where some curious assistants put him together. As the Modular Man prepared to sneak the unconscious Killer Shrike out of the hospital, a Conspiracy agent arrived and told the Modular Man that they would definitely get out of there, but that they would do things his way. Conspiracy agents blew up Bloodstone Island. Domino continued to occupy Samantha Eden. (Rampaging Hulk I#6/2 - BTS) - Bloodstone tracked the energy impulses from the Death Suite to a control room in the suite above. There he encountered several Conspiracy agents who acted as empathic batteries and channeled the combined mindforce of the Conspiracy against him. Bloodstone's own power, channeled through his Bloodgem, overcame his attackers. Later, Kaballa used the monstrous Sharzan the Elemental to stun and capture Bloodstone, enabling Kaballa to transport them both to his subterranean base. (Rampaging Hulk I#8/2) - Bloodstone was brought before the Conspiracy, where one of its members, Dr. Juden Bardham, a cardiologist, cut the Bloodgem from his chest. The Conspiracy left Bloodstone for dead, traveling to the cavern in which Bloodstone had gained his power millennia before, and prepared to perform the ceremony to gain its power. However, the Exo-Mind instead absorbed the Conspiracy members and used their energies to coalesce the Bloodgem fragments into a single, monstrous crystalline creature. Reborn in the Bloodgem creature, the Exo-Mind traveled to and rampaged through New York. However, residual Bloodgem energy in Bloodstone's corpse reanimated him, and he made his way from the Conspiracy's underground citadel to confront the Bloodgem creature. Now absolutely focused on a sole purpose, Bloodstone used his third eye to access the astral plane on which the Exo-Mind existed. His chronic exposure to the Bloodgem's energies enabled him to survive the Exo-Mind's assaults and penetrate the outer mind/form, and to confront the very Hellfire Helix itself. Disrupting the Hellfire Helix, Bloodstone severed the Exo-Mind's connection to the Bloodgem. The Bloodgem creature shattered into countless fragments, while Bloodstone's body decayed into a lifeless skeleton. Meanwhile, Brad Carter traveled to Bloodstone Island to investigate the interruption of its transmission signal, and he was incinerated by an Arms-Man. (Captain America I#358) - Centurius' corpse was seen amongst the Conspiracy members within their former base deep below Central Park (see comments). (New Avengers I#1 (fb) - BTS) - Centurius somehow survived--perhaps by transferring his mind into a cloned body--but was imprisoned within the Raft section of Ryker's Island. (New Avengers I#1) - Centurius was among the Raft inmates gathered before Electro during the impending breakout. (New Avengers I#2-3 - BTS?) - Centurius was presumably among the Raft inmates fighting to escape as the pre-"New Avengers" attempted to contain them. (New Avengers I#4- BTS) - Centurius was pictured amongst the Raft escapees on the S.H.I.E.L.D. files sent to the Avengers. (New Avengers I#35) - Centurius was one of a large number of super-villains who met with the Hood, hearing and apparently accepting his position as the new Kingpin of super-villain crime. For his attendance, he was given $25,000. (New Avengers Annual#2) - Centurius was part of the Hood's super-villain army that ambushed the "New" Avengers' base at Dr. Strange's Sanctum Sanctorum. He was incapacitated by the Zom-powered Dr. Strange and then taken into custody by SHIELD. (New Avengers I#46 (fb) - BTS) - Centurius was apparently freed by the Hood. (New Avengers#46) - Centurius was present along with the rest of the Hood's army when they tortured a SHIELD agent who proved to be a Skrull. Guided by Demonicus, the Hood used his demonic powers to determine that a skrull was impersonating the Slug, and he shot and killed the imposter. (New Avengers I#50/New Avengers I#55 (fb)) - When Cage's Avengers tried to lure Osborn's Avengers into a trap at an old Hellfire Club base, Osborn instead contacted the Hood who led his super-villain army to assault Cage's Avengers (Cage, Captain America/James Barnes, Ms. Marvel/Carol Danvers, Ronin/Clint Barton, Spider-Man, Spider-Woman/Jessica Drew, Wolverine/Logan/James Howlett). Centurius joined the Hood, Answer, Blackout, Blood Brother, Brother(s) Grimm, Centurius, Chemistro, Corruptor, Crossfire, Cutthroat, Dr. Demonicus, [Dormammu], Griffin, Jigsaw, Living Laser, Madame Masque, Mandrill, Razor-Fist, Scarecrow, Shockwave, Slug, Vermin, Wizard, the Wrecking Crew in this assault. Ms. Marvel channeled Spider-Woman's power to stun the criminals and allow the Avengers to escape. (Dark Reign: The Hood#4) - Centurius partied at one of Hood's safe houses and passed out after drinking too much. (Marvel Zombies 4#2) - Mandrill, with Centurius, Hood, and Crossfire, debated the advantages of purchasing a zombie virus from Black Talon. (New Avengers I#60) - A furious Hood returned to his army and killed Jonas Harrow for his betrayal. Hood chided the criminals for their panicked actions, and told them they now had to follow Osborn's orders. Osborn told them to hunt the unregistered heroes and bring them back, dead or alive. (New Avengers I#61) - The Hood used the Asgardian Norn Stones to give those in his army the ability to track down the targeted heroes, increasing their own strength and power as well. Comments: Created by Jim Steranko and Frank Giacoia. 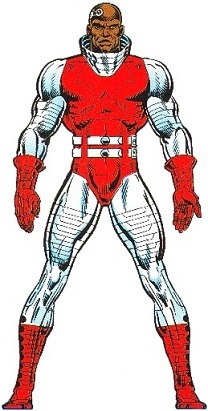 The OHotMU Master Edition states that he was "shown to be present at conference on genetics in the 1930's along with future High Evolutionary and Arnim Zola." I guess that must be him in the background on panel 2 of page 4 (and a slight glimpse in panel 3)...the character is of dark complexion with black hair...that's about all you can see. The same entry states that Centurius has minimal experience at hand-to-hand combat. However, in S.H.I.E.L.D.#2, he was tackled from behind by S.H.I.E.L.D. agent and veteran FBI agent Jimmy Woo, but still managed to break free and flatten Woo with a single punch. Further note that the top image, while the clearest straight-on image, uses the same costume, but with the colors completely different than those he has been seen to wear. The cover image of S.H.I.E.L.D.#2 has the colors off, too. Only the one next to the powers section has the colors correct. It has since been confirmed that Microverses are not realms existing within atoms, etc, but rather just dimensions accessed by shrinking. 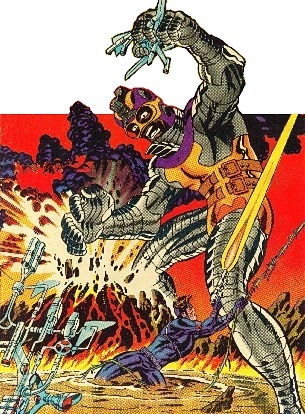 All known Microverses were allegedly merged into a single realm during a struggle between Thanos and Baron Karza. Anyway, the point to me is that Centurius actually found a way to evolve and enlarge microscopic life forms. It's worth noting that the Bloodstone stories in Rampaging Hulk#1-6 were written by John Warner, while the wrap-up in #8 was written by Steve Gerber. Can I be cynical here? In charting out who escaped and who didn't, I noticed that the escapee pictures in NA 3 or 4 were all taken directly from the OHOMTU Master Edition. Upon further reflection (though I certainly didn't check everyone), it began to appear that every one of the prisoners was in the Master Edition. It is oddly coincidental that all of these guys were in the Master Edition. I suspect Bendis sat down with the ME, picked guys that looked cool or caught his eye or whatever the criteria was, and then sent the MEs off to the artist, but didn't really know anything more about them than what was printed there. When he later found out a chunk of 'em were dead, he hurriedly inserted comments to that effect into later issues and tried to portray it as intentional. I'd like to have the time right now to include sub-profiles on Centurius' bases, the Arms-Men, his robots, mutates, etc., but time conspires against me. Some other year (decade). For the purposes of anyone trying to compile a page of characters of related race, creed, etc., I'll specify that Centurius is African-American. Given the state of African-American relations, prior to WWII, I would hazard to guess that Noah Black obtained his doctorate abroad. Centurious/Noah Black holds a PhD in genetics, considering he won a Nobel Prize in the 30's, we could assume that his doctorate work occurred somewhere after WWI, but before he won the Nobel Prize. The First African American to earn a doctorate from an American university was Edward Alexander Bouchet in 1874. He earned PhD in physics from Yale. W.E.B. DuBois was the first African American to earn a doctorate from Harvard, he did so in 1895. The first African American woman to earn a doctorate was Sadie Tanner Mossell in 1921. It's certainly not out of the realm of possibility that Noah Black, like Samuel M. Nabrit and Percy Lavon Julian earned his doctorate in this climate and time period in a stateside university like Brown, Yale or Harvard. Alfred Day Hershey is another comparable contemporary and Nobel Prize Winner to boot - though Hershey won over 30 years after Black and was the first African American to do. Just a thought - your comment had me thinking and sent me off to do some research. I would hazard to guess that it was originally going to be Noah "Centurius" Black. But, that this idea was nixed, by the senior Bullpenners @ Marvel, as this character was probably already being used for the Bloodstone Conspiracy.